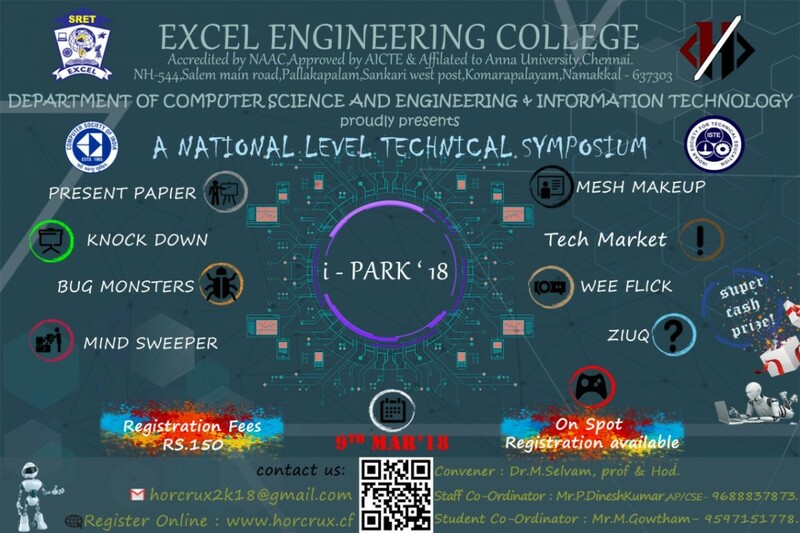 Excel Engineering College - Department of Civil Engineering is organizing "Third National Level Conference on 'Advances in Civil Engineering'" on 28th September 2018. 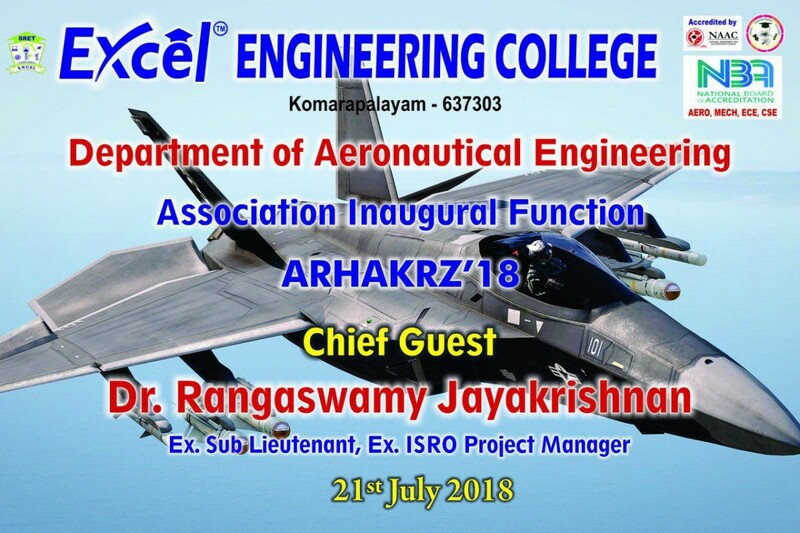 EXCEL ENGINEERING COLLEGE-DEPARTMENT OF AERONAUTICAL ENGINEERING ORGANIZING THE DEPARTMENT ASSOCIATION INAUGURAL FUNCTION, ARHAKRZ ON 21/07/2018 (AN) AT PAVAAIAMMAL HALL (A/C), EEC. 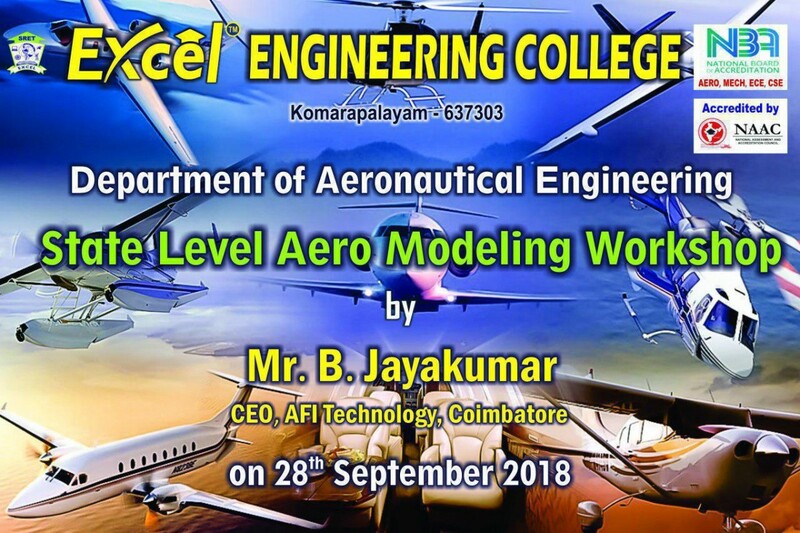 Tamilnadu State Council for Science and Technology has given financial assistance for workshop on Design and Fabrication of Drone for Agriculture purpose-Rs.20000 to Mr. A. Karthikeyan Associate Professor-Aeronautical Engineering, Excel Engineering College. 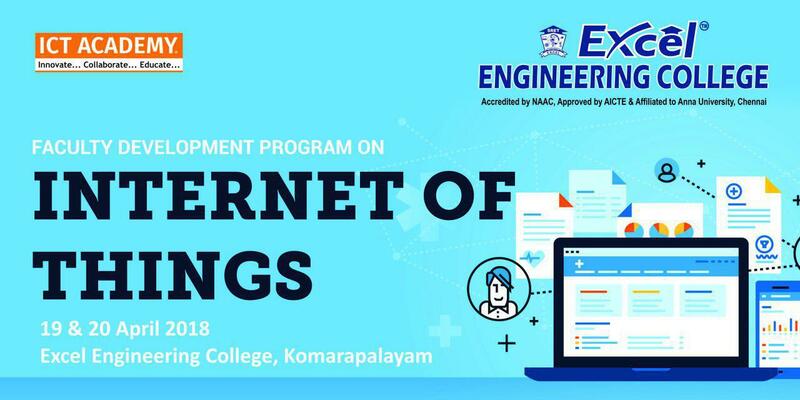 Excel Engineering College organized an Accelerate Bootcamp-Industry Enabled Faculty Development Programme with Industry Experts from Diverse Brains Life Solutions LLP for CSE and IT on 14th May 2018 in Thiruvalluval Hall. Excel Engineering College in associtation with IIT Remote Center will be organizing a Two-Week AICTE approved FDP on 'Pedagogy for Online Blended Teaching-Learning Process - FDP201x' from 3rd May to 30th May 2018. Venue: VKR memorial hall , Excel Campus Date: 15.09.2017 Time: 10.00 Am Motivational talk By: Jayaprakash Gandhi, Career Consultant and Analyst, Salem. Excel Engineering College - Department of Civil Engineering has organized WORK SHOP ON “ENTREPRENEURSHIP” Sponsored By NSIC Technical Service Centre and The National Small Industries Corporation Ltd (A Government of India Enterprises) on 4th March 2017 at Pavayammal Hall /AC. Excel Engineering College - Department of Mechanical Engineering has organized “ENTREPRENEURSHIP AWARENESS CAMP” from 18th October to 20th October 2016. Excel Engineering College - Department of Mechanical Engineering organized "Sapling Distribution" function on 15th October 2016 to mark the 85th Birthday of Dr. A.P.J. Abdul Kalam. 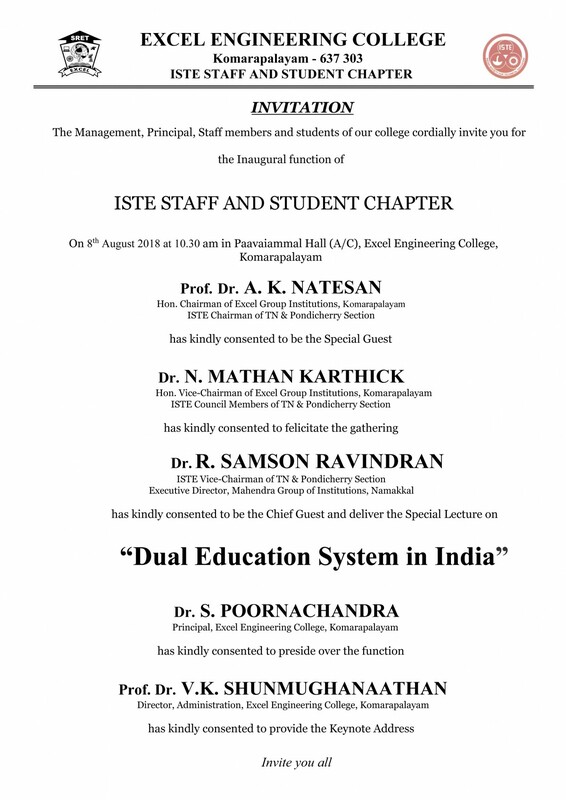 Excel Engineering College - Department of Mechanical Engineering is organizing the Inaugural Function of Student chapter - "Indian Society of Mechanical Engineers" ISME on 30.09.2016 at Pavaiammal Hall, Excel Campus. Excel Engineering College Department of CSE & IT has organized a One Day National Seminar on " Academic Project Development and Documentation" on 27th August 2016 at Excel Campus. Excel Engineering College - Department of Civil Engineering has organised a "Two Day Workshop on Bridge Design" on 25th & 26th August 2016 at APJ Abdul Kalam A/C Hall. Excel Engineering College - Department of Electronics & Communication Engineering has organised association inauguration function "FROPTRANZ-2K16" 30th July 2016 at Dr. A.P.J. Abdul Kalam A/C Hall. Excel Engineering College has organised the inaugural function for Mechanical Engineering Department association "Machine Warriorz" on 15th July 2016 at Paavaiyammal Hall. Excel Engineering College - Department of Civil Engineering has organised association inauguration function "SPARTANZ" 15th July 2016 at Dr. A.P.J. Abdul Kalam A/C Hall. Excel Engineering College & Excel College of Engineering & Technology has organised the "Commencement of Classes for 2016-2017 Batch" students of Aeronautical Engineering, Electical & Electronics Engineering, Petroleum Engineering & Petrochemical Technology on 14th July 2016 at V.K.R. Hall. Excel Engineering College & Excel College of Engineering & Technology has organised the "Commencement of Classes for 2016-2017 Batch" students of ECE, CSE & IT on 13th July 2016 at V.K.R. Hall. 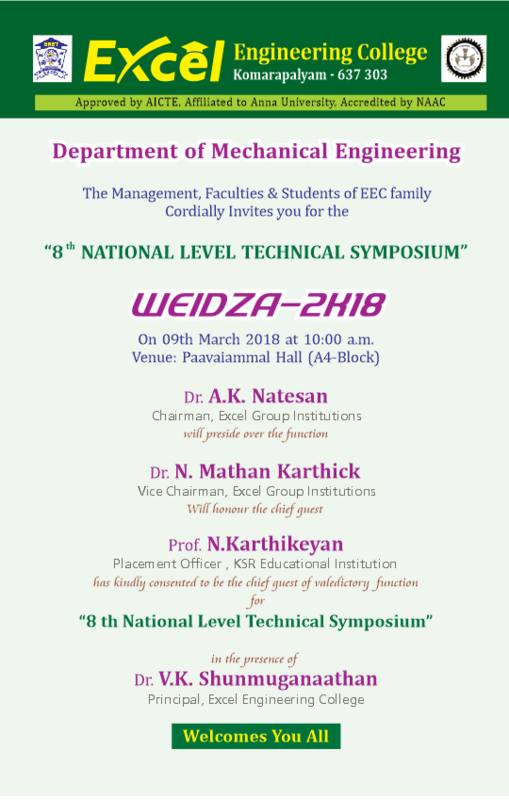 Department of Mechanical Engineering conducted "Ayutasiddhi 2k16" a National Level Technical Symposiumon 12th March 2016 at Excel Engineering College. 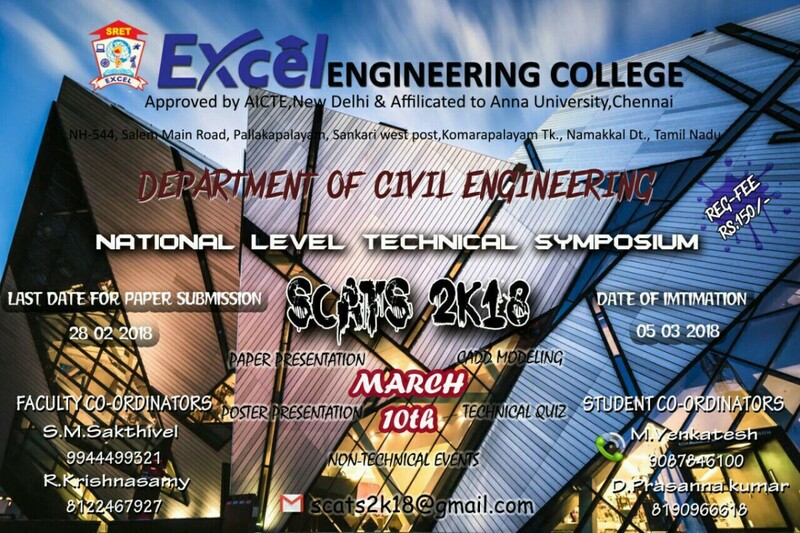 Department of Civil Engineering conducted "Spartanz '16" a National Level Technical Symposiumon 8th March 2016 at Excel Engineering College. 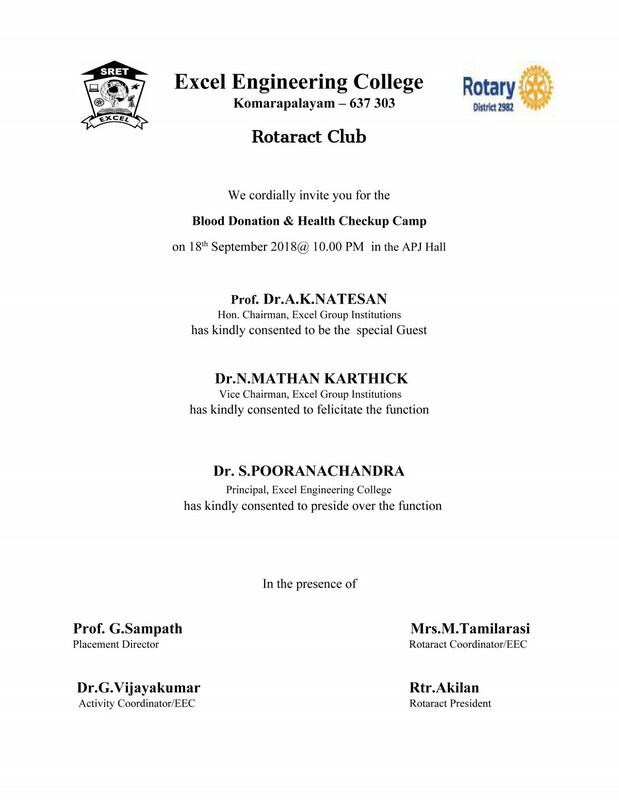 NSS & YRC jointly organizes " Free Dental Awareness Camp" for Students & Faculty to be held on 14/09/15 at Excel Engineering College. 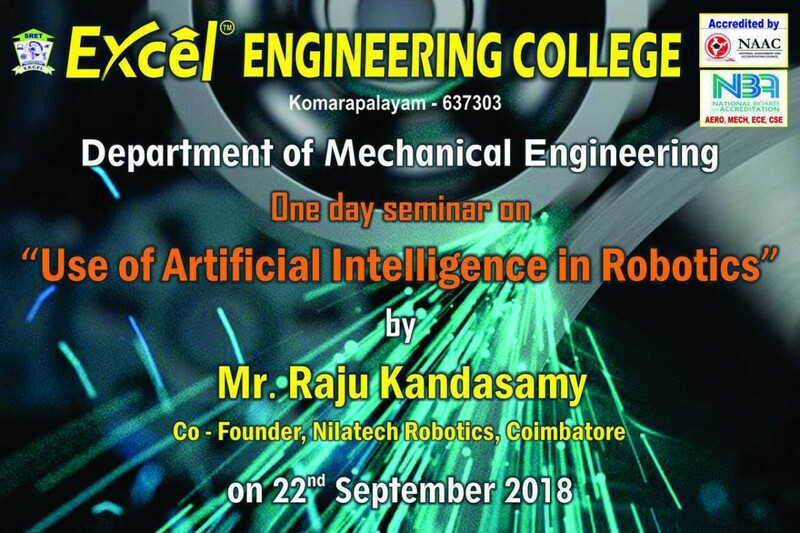 Excel Engineering College – Electronics Communication Engineering Conducted for Guest lecture on "DSP & EE&I" organized by Dr.R.S.Sabeenian,Sona College of Technology,Salem.& Prof.S.Srinivasan, KSRCT, Tiruchengode held on 15/9/15 at APJ Hall A/C. Department of Science and Humanities Organized Guest lecture on "Recent Trends in Polymer Chemistry" held on 19/09/2015. Anna University 12th zone women's Volley Ball Match Inauguration held on 25.09.15 9 am @ Excel Engineering College. "Hands On Training" on J2EE for III Year CSE & IT on 29.9.2015 & 30.9.15 by Poovaragan.V, Technical Trainer, Indra Institute of Education, Coimbatore. 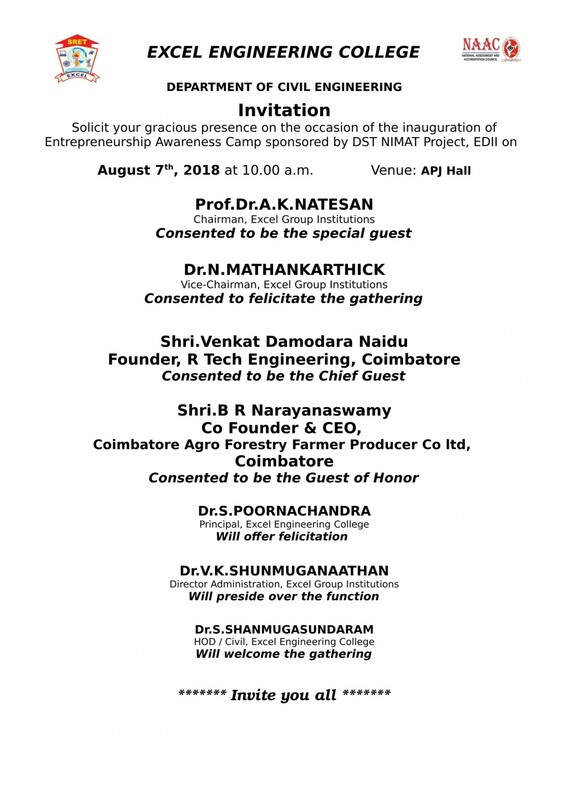 Commencement of first year classes for the academic year 2015 to be held on Wednesday, 15th July 2015 at 10.00 am in V.K.R A/C Hall. NS2 National seminar of Conducted by Excel Engineering College held on 26nd February 2015. Graduation Day of Excel Engineering College held on 22nd February 2015. Department of CSE & IT of Industry Explorer-15 (first edition) on 31.01.15.